Four experts from CBRE’s Office Agency Department have been promoted to positions at the level of Associate Director and up. This follows from the dynamic growth of the department and the rapidly expanding scale of activities across Poland’s main cities. The total volume of square meters leased by CBRE’s Office Agency Department (Tenant Representation and Landlord Representation) since the beginning of 2015 amounts to more than 315 000 sqm throughout Poland. The largest transactions recorded in 2015 involved the following buildings: Wojdyła Business Park in Wrocław, Konstruktorska BC in Warsaw and CH2M Center in Cracow. 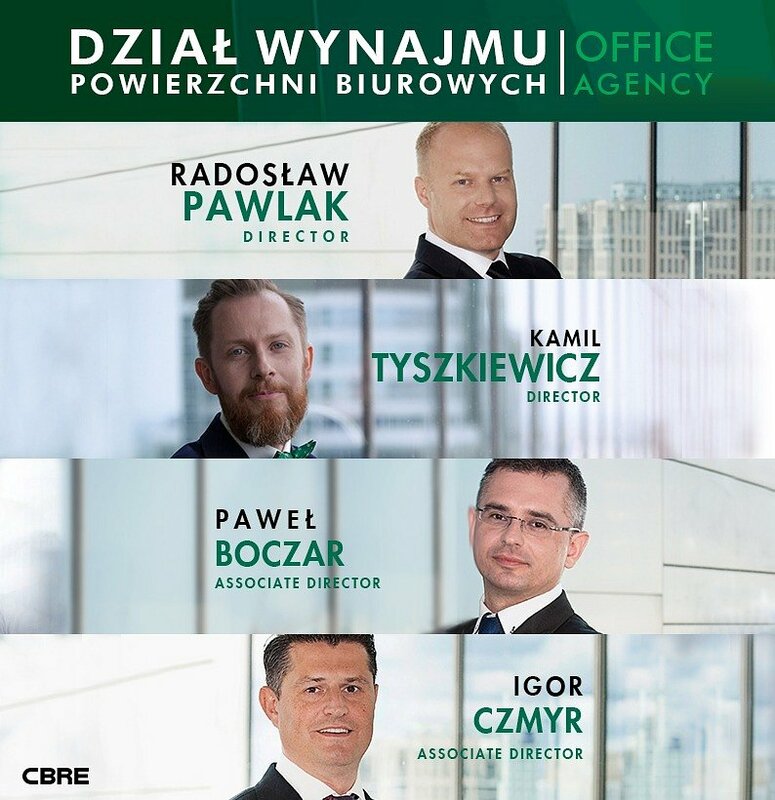 The portfolio currently managed by CBRE’s Office Agency Department comprises 33 commercialized schemes, this to include: 26 buildings located across Poland and 7 modules of space to be subleased. Nearly 40 consultants continuously monitor the office market, provide their clients with always up-to-date data and then select the offers most suitable for them. There are two service lines operating within the department: Landlord Representation which provides consultancy services to office building landlords and developers and Tenant Representation whose team advises international and Polish businesses in the process of leasing office space. Radosław Pawlak – has been promoted to the position of Director in the Office Agency Department. He is responsible for establishing new and maintaining existing relationships with landlord clients. Prior to his promotion, Radosław was additionally responsible for transactions on the Poznań market. He has been actively gaining experience on the property market since 2004 and working for CBRE since 2012. The portfolio of buildings leased by CBRE’s Office Agency Department includes: Bobrowiecka 8, Centrum Marszałkowska and Wolf Marszałkowska. Kamil Tyszkiewicz – has been promoted to the position of Director in the Office Agency Department. His strong points are his expertise and more than 9 years of experience gained while working with numerous developers, investment funds, tenants and legal firms. Additionally, Kamil has a wealth of experience in collaboration with businesses from the BPO/SSC sector. As part of his daily activities, Kamil manages Poland’s south region, where his team is active on markets such as Cracow, Katowice and Wrocław. Paweł Boczar – now Associate Director in the Office Agency Department. As part of his duties, Paweł conducts negotiations, wins new clients and monitors the office market in Poland’s Dolnośląskie province. Igor Czmyr – holds the position of Associate Director and is responsible for development of the Technical Consultancy Platform for Office Agency Department’s clients. In order to ensure provision of comprehensive range of services to clients, Igor, as part of his daily operations, supports the Office Agency Department with his expertise in office space design and fit-out, including aspects such as technical consultancy, workplace strategy, architecture and project management.